Technology, especially the Internet, presents us with new opportunities for authentic tasks and materials, as well as access to a wealth of ready-made ELT materials (Dudeney & Hockly, 2007, p. 8). Therefore, it will not be a huge leap to jump from blog filing cabinet to blog portfolio. The traditional portfolio process is supported almost perfectly by Weblogs. First, students collect the work they might want to consider highlighting in their portfolio and then they select those that represent their best work. This can include links to videos, podcasts, presentations, and more, all of which we'll cover in later chapters. They then reflect on the choices they made something they can easily do in a blog post. Finally, they publish the result for others to see. Even more powerful is the idea that these portfolios could conceivably span many grades and many classes (Richardson, 2010, p. 39). According to Richardson (2010, p. 31), blog can be used as an ongoing assessment which the students can provide the samples of their writing in their blog. In fact, Barret (2013) has created an online portfolios using more than 15 different software packages with Weblogs as the dominant e-portfolio. As the Web becomes more and more of a source of content for our teaching and learning, it also renders paper less and less effective as a way to capture the information we find relevant. In addition, Morris (2013) enhances the approach to blog as the digital portfolio after the previous time the students’ blog was used as the system where the students can submit and post their personal writing. Hence, Richardson (2010, p. 28) states that Weblogs and the like were born out of the need to save and organize the digital ideas we find interesting so that we can annotate them with our own interpretations and easily return to them when we need to. Moreover, we are not only able to collect links and text in our Web notebooks, but also include audio, video, photography, and more. In fact, many educators see the Web as the perfect home for electronic learner portfolios that can be shared easily with audiences of peers and mentors. Beside involving the students and teachers, having weblogs as the digital portfolio also gives more spaces for the students’ parents to be concerned on their children improvement at school (Morris, 2013). Cofino (2011)categorizes this involvement as a the place for the students to present their showcase portfolio. Additionally, to make the students get more motivated when engaging with their blog, Cofino (2011) suggests that the teachers encourage the parents by sending them email to discuss the writing that their children have posted on blog. Cassidy (2013) classifies weblogs as a digital portfolio that is also ongoing assessment. Weblogs provide the students to have authentic audience, parental engagement, and give the students opportunity to create an online community. 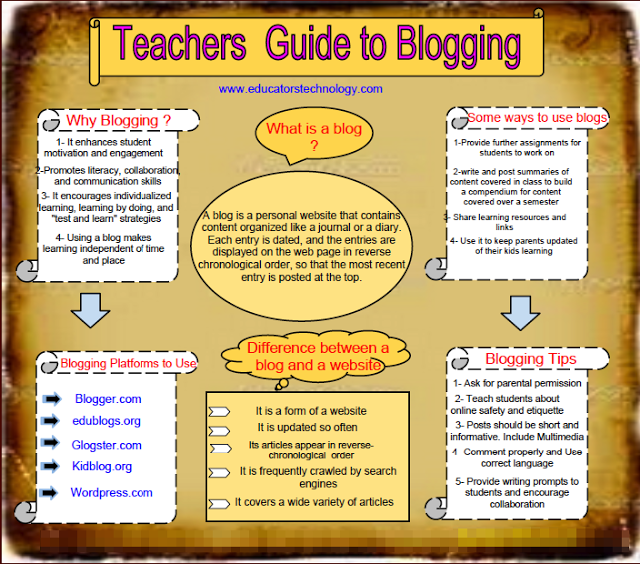 Additionally, Cassidy (2013) states that the students’ blog can be used as the starting point of the class discussion. The chronological nature of blog posts lets the students, their parents and the teacher to see where they began and where they are at present. Thus, the teachers and the students can think and set the goals of the class together.